Ideal for drummers and bassists wearing headphones. Protects your hearing. Excellent in small studios for accurate, powerful low-end monitoring. Mounted where other band members can feel the bass drum, grooves instantly tighten up. 5-1/2"W x 5-3/8"H. Plugs into your power amp's speaker out. 4 ohms. 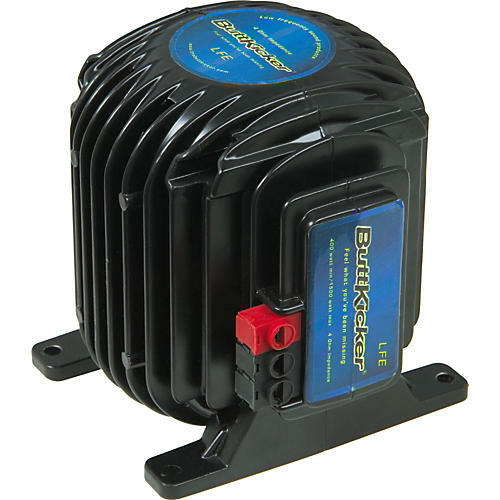 The Guitammer Company products are warranted against defects in materials and workmanship for a period of [one or two years - visit Buttkicker's website for warranty on a specific product] from date of purchase by the original end-user. Items returned for repair under warranty will be repaired or replaced at the sole discretion of The Guitammer Company without charge for materials or labor, providing such items are returned for inspection, transportation prepaid, to The Guitammer Company or an authorized service center. All repaired or replaced items will be returned freight collect. Warranties do no apply to products that have been subjected to abuse, accident, modifications, improper handling or installation, or repairs made by anyone other than The Guitammer Company or an authorized service center. The Guitammer Company shall be the final authority in the determination of all warranty service claims. Please contact us before returning any defective products to the store where they were purchased.